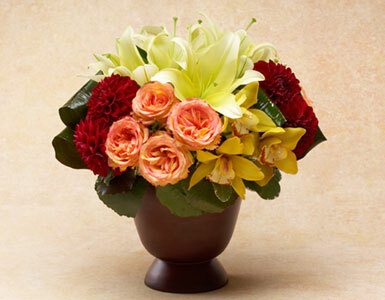 A fall mix of Asiatic lilies, Ambiance roses, dahlias and orchids in a clustered design. We specialize in fall floral arrangements, fall colored flowers, mixed fall flowers, Thanksgiving flowers, and harvest flowers. We guarantee prompt fall flower vase or urn delivery to your home or office in Beverly Hills, West Hollywood, Santa Monica and greater Los Angeles area.